Today, the Institute helps to build fair, inclusive and democratic societies in Africa through carefully selected engagements and interventions. It contributes to post-conflict stability, good governance and human security through programmes that promote political reconciliation and social and economic justice across Africa. With its base and origin in South Africa, it continues to learn from the South African experience of transition and explores projects and partnerships that will deepen the efforts to build fair, inclusive and democratic societies in this country, but also the rest of the continent. IJR’s work is increasingly relevant to other global post-conflict societies and the 2017–2020 strategy builds on the organisation’s experience and strengths, to engage in a multi-faceted way on issues of justice and reconciliation. The Institute for Justice and Reconciliation enables African and global communities to promote reconciliation and to apply human-centred approaches to socio-economic justice. Production of cutting-edge research and innovative analysis generating new knowledge, insights and resources. Hosting of critical conversations and dialogues as drivers of transformation. Establishing networks for justice and reconciliation through training and capacity building. Communicating key messages to advocate for change. Even though the application of each methodology on its own has a positive impact, the IJR approach for 2017–2020 is to ensure continuous integration of the methodologies in order to maximise impact of IJR interventions. This value chain approach will also strengthen internal collaboration and organisational efficiency. The IJR’s Theory of Change is closely aligned with the integrated methodology and is based on a bottom-up causal pathway to justice and reconciliation that builds on the prerequisite of community involvement, which in turn contributes to empowerment of that community. To achieve transformation which can lead to positive peace, the IJR believes that communities must participate in identifying, analysing and creating solutions to the conflicts and injustices that affect them. The IJR’s role is to use its expertise to accelerate the empowerment of such communities with knowledge and skills in order to achieve justice and reconciliation. The IJR does this by way of its flexible and integrated methodological approach, whereby it designs interventions according to the needs of each community and situation. 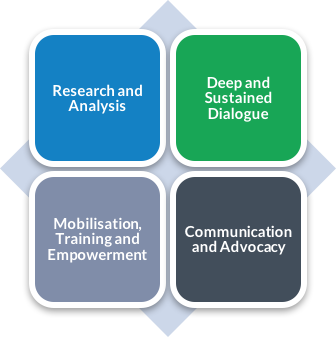 An intervention can use research, dialogue, communications, or training as an entry point to achieve its overall objectives, but IJR will continuously consider other types of activities to create lasting community empowerment. This integrated approach forms the basis of the 2017 – 2020 strategy. The IJR has further consolidated its expertise across five justice and reconciliation themes and two cross-cutting themes which will guide the strategic decisions on which interventions to undertake in support of the IJR theory of change. TRANSPARENCY & ACCOUNTABILITY: To ensure accountability, IJR’s intentions are open to partners and stakeholders and it communicates its intentions continuously and clearly. Policy and management decisions are clear in terms of their rationale and context, and placed on record for all in the organisation to see. As such, IJR and its staff remain accountable to the Institute’s founding principles and all stakeholders with whom it partners, especially those in society who were rendered more vulnerable by the historical injustices IJR is assisting society to address. INTEGRITY: IJR strives for congruency between the national ideals that bequeathed it with the historical legitimacy it needed when it was formed and its current role in the society. As an organisation that strongly advocates ideals which take a stand against corruption, fraud, systemic racism and hatred of the other, IJR’s integrity and that of its staff should be defined by unrelenting pursuit of these honourable ideals in all we do. FAIRNESS & INCLUSIVITY: IJR actively encourages just and equal participation in its internal and external interventions. IJR aims to foster a democratic environment for its interventions, which is free from discrimination and stereotyping, as well as which enables open-mindedness and the sharing of a diversity of perspectives. CAPACITY DEVELOPMENT: The IJR approach is to develop capacity in everything it does – from internal organisational activities to engagement with its project communities. The IJR’s activities in 2017–2020 will be guided by the five priority themes and two cross-cutting themes. The themes define the WHAT that the IJR will address, and the HOW is determined by the integrated methodological approach which will ensure that, irrespective of the theme or geography, an integrated way of thinking is applied to different types of interventions. For this reason the strategic objectives are defined along methodological lines as the way of working applies to all themes and geographies. The strategic objectives have organisational-level defined outcomes and indicators, which are translated into annual work plans for all organisational divisions.